This is a seasonal series from Fiscus that many in the community eagerly await every year. 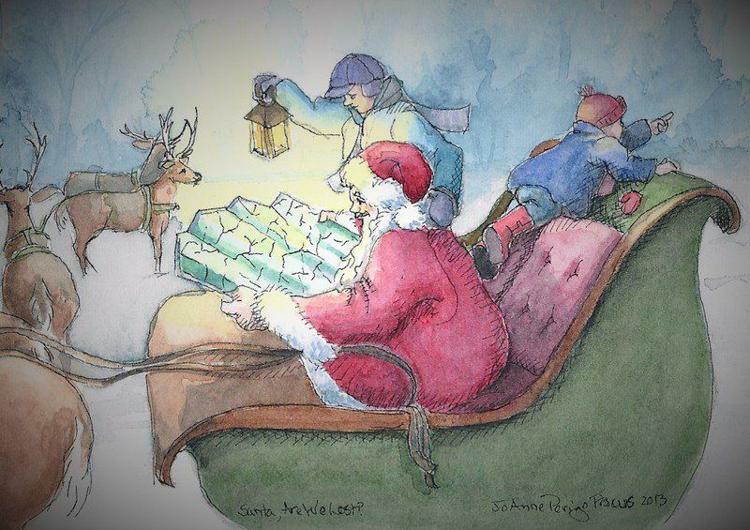 Her festive, delightful, timeless and brilliant illustrations of Santa Claus scenes using watercolors and ink have added zing to the local Christmas spirit for many years. A lifelong resident of Terre Haute, Fiscus holds a master of arts education degree from Indiana State University and has served as a teacher with the Vigo County School Corp. for 35 years. Since retirement in 2010, she has undertaken other teaching projects in Terre Haute. Fiscus’ art is well-recognized locally and in other parts of the United States. Among her several specialties are large murals, which enrich buildings across the country. Examples include her 50-foot depiction of a coral reef at the Exotic Aquarium of Miami in Florida and her Combs Chapel mural at Union Hospital in Terre Haute. Other kinds of two-dimensional art by Fiscus are regularly featured in shows and galleries in the region, including juried exhibits where she has won several awards over the years. While her subject matter and media are vast and diverse, Fiscus said that for a few weeks from October to Thanksgiving, she becomes a kid again, and “sees the magic of the season through the eyes of a child.” Her annual “Santa Visions” range from images of Santa with his favorite reindeer to portrayals of her favorite Christmas carols. Fiscus and her husband and fellow artist, Bruce, also are members of River City Art Association, and maintain a home and studio in the Collett Park neighborhood in Terre Haute. They can be reached at 812-607-0284. Wabash Valley Art Guild meets on the second Thursday of the month, unless otherwise noted, in the library at Seventh and Poplar streets.